Love Homemade DIY beauty ideas? 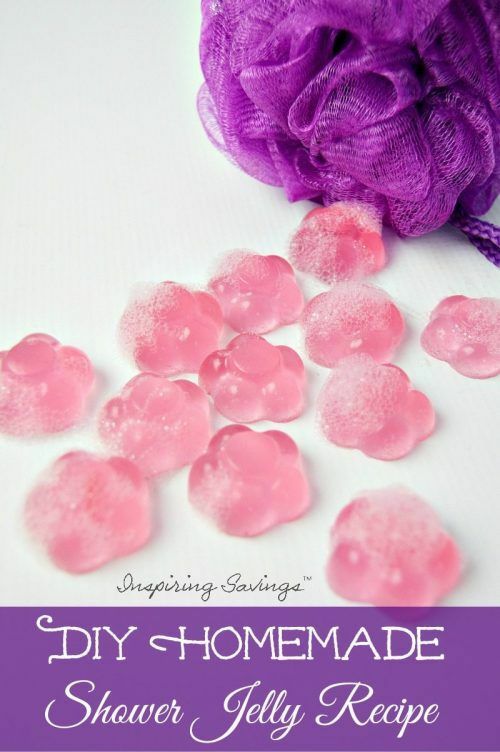 You can make your own Easy Shower Jelly DIY Recipe. Not only are they fun to make, but it a rewarding. Get a SPA experience at home! Perfect gift for moms, teachers and more. It is almost impossible to walk by your favorite cosmetic or bath & body store and not be drawn into purchasing Shower Jellies. They are pretty in color, smell wonderful and you can almost imagine yourself having a mini spa day at home. I just can’t see myself paying expensive prices when I can make it at home for very little. You can make your own Shower Jelly for super cheap. It also is a great homemade gift idea. You can just use any shower gel, body wash or shampoo. I do prefer to use better quality shower gel. It does make a difference with the scent. Are you new to Shower jelly? Shower Jelly is just a gelatinous form of shower gel. At room temperature, it falls somewhere between liquid shower gel and bar soap in terms of consistency—like Jell-O (it is made with gelatin). You can use it as is. I like to smash it into my loofah. It makes showering more fun. You can also place it in the refrigerator for a bit to get it cold. It will make showering a whole different experience or you can freeze it if you prefer a more bar-soapy feel. 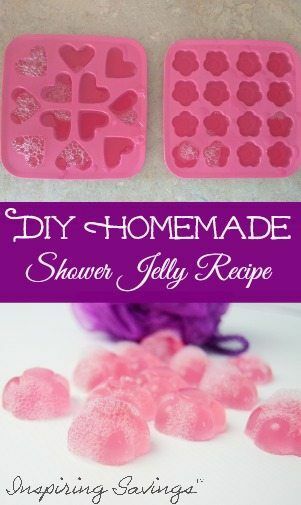 However, you choose to use your Easy Shower Jelly I am sure you are going to love them. Combine the boiling water and the gelatin in a bowl with a whisk, until there are no lumps. Add the body wash, and mix gently so as not to create a lot of bubbles. If your body wash isn’t dyed, you may add some soap colorant for color. I used a red body wash, and it turned out this pretty pink. Pour your mixture into molds. I suggest a smaller silicone mold as I used, or you can use something you have on hand, like an ice cube tray. FIll the molds to the top, and place in the fridge for 6+ hours. I left mine overnight, and they seemed to be set up well. Remove your jellies from their mold after their time in the fridge. Keep your jellies in a cool, dry place, and avoid direct sunlight. I just keep mine in the fridge until I need them, but I’ve also stored them under the bathroom sink, or in a dark cabinet before without any issues. Just a few side notes. This batch filled up two silicone mini molds for me. Make sure to rinse the dishes and utensils you used quickly, so the gelatin doesn’t set up. They can be hard to clean if they’re left alone to dry on the counter! This looks very interesting. I have to try this.